Having dealt with thousands of stowaway cases around the world we have had first hand experience of the problems which arise during stowaway interviews which hinder the identification process. The successful repatriation of a stowaway largely depends on the procurement of an emergency travel document, which in turn counts on acquiring high quality photographs and statements for use by embassies and consuls. The following sections provide helpful aids and advice which will assist in accurately interviewing, photographing and documenting stowaways in order to facilitate their disembarkation and repatriation. 1. Questionnaires should be completed by stowaway's and not by the master or a correspondent. 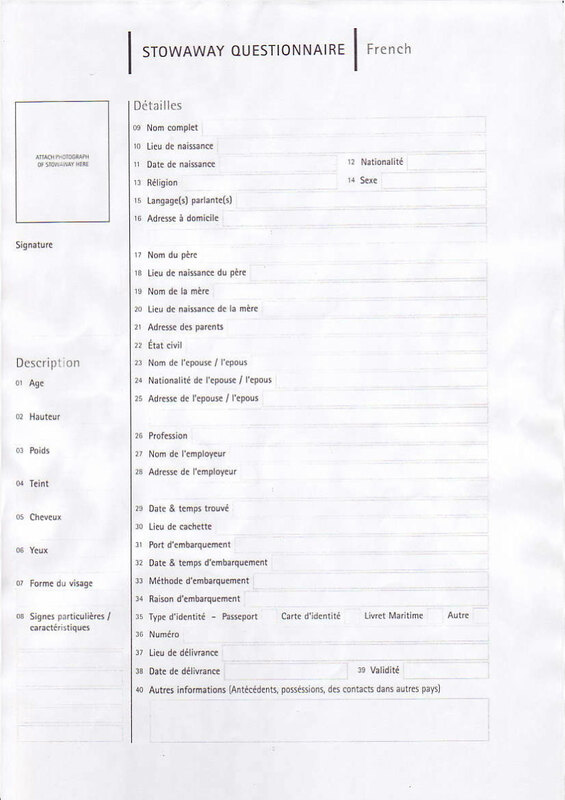 Spelling mistakes and writing styles often provide indications to a stowaway's origin, therefore typing questionnaires or filling in statements on the stowaway's behalf can irradiate many hints to the stowaways true nationality, which in turn lengthens the identification period. 2. Many stowaways will refuse to complete statements, either because they claim they do not understand the language or because they cannot write. Bearing in mind that some stowaways will do or say anything in order to lengthen their stay on board a vessel, it is worth persisting with the acquisition of a statement. In our own experience we have found that only a minimum of stowaway's are illiterate. 3. When a group of stowaways are requested to complete questionnaires, it is very important to separate them whilst statements are being made. Stowaways in groups often share stories and purposefully falsify information, making verification of nationality difficult. 1. When photographing a stowaway it is important to remember the only area of the photograph that will be placed on a travel document will be the head of the stowaway; so photographs of the stowaway's side, back, or a nice view of the dock are of little assistance. 2. Some embassies and consuls have strict regulations regarding the quality of the photographs used for documentation. It is therefore important to ensure that stowaways remove any items of clothing (hats, caps or sunglasses) that may conceal areas of the face, eyes or hair. 3. The majority of embassies who are willing to document stowaways request at least four passport-sized photographs for their records, so it is important to obtain a good selection of shots. If it is not possible to acquire a camera capable of producing passport-sized photographs, use a normal camera and cut (or crop if using a digital camera) the photo to size.